(Newser) – So much for that tentative deal. Chicago teachers this evening opted not to vote on a pact that would end their weeklong strike, saying they needed more time to digest the details, reports the Chicago Tribune. Union chief Karen Lewis said the earliest classes could resume is Wednesday. But soon after the union's decision, Mayor Rahm Emanuel said the city would file suit to immediately end what he termed an illegal strike, reports AP. As of now, schools are set to be closed tomorrow. lets face it folks, this is the future. obamas america. Fire every damn one of them....then their messiah obama in November. 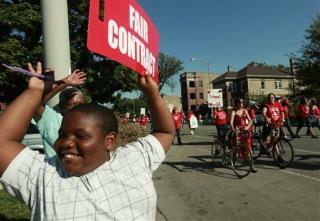 Rahm Emmanuel and the Teachers' union. They deserve each other.